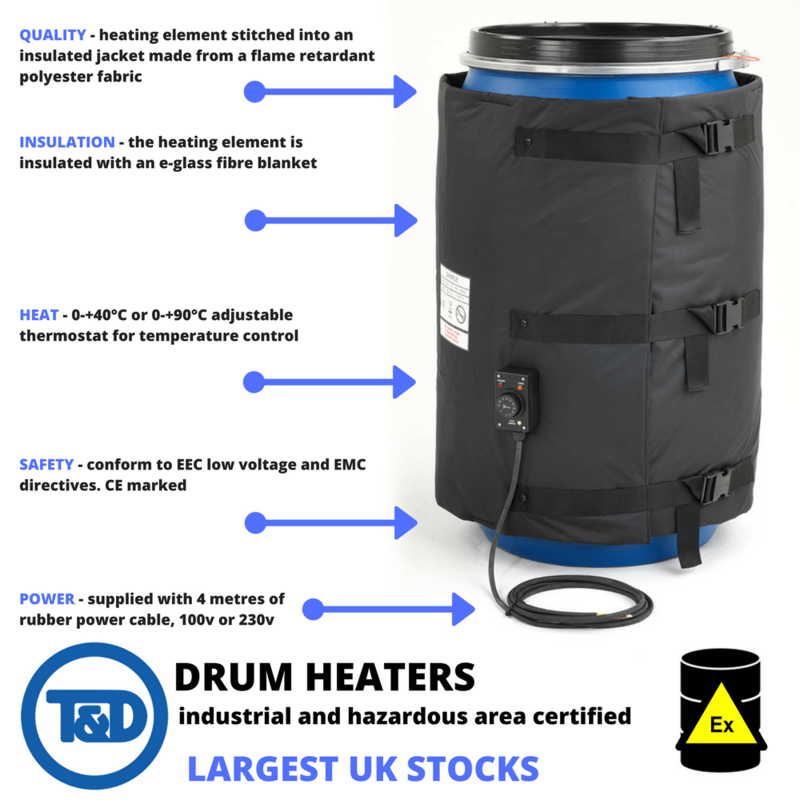 T&D are the UK’s largest stockist of Drum, IBC & Tank Heaters & Jackets. 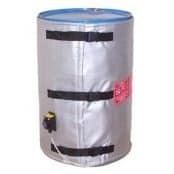 Bulk stored products are at risk of crystallisation at temperatures typically below 2°C – to prevent product crystallisation the contents of storage containers, including drum and IBC types, can be frost protected using electrical surface heating jackets to maintain optimum temperatures to avoid product wasteage caused by frozen contents. Crystallisation of manufactured products has major negative impacts on transport and delivery times. Most liquids freeze by crystallisation. Crystallisation is the (natural or artificial) process by which a solid forms, where the atoms or molecules are highly organised into a structure known as a crystal. Some of the ways by which crystals form are precipitating from a solution, freezing, or more rarely deposition directly from a gas. Attributes of the resulting crystal depend largely on factors such as ambient temperature, air pressure, and in the case of liquid crystals, time of fluid evaporation. 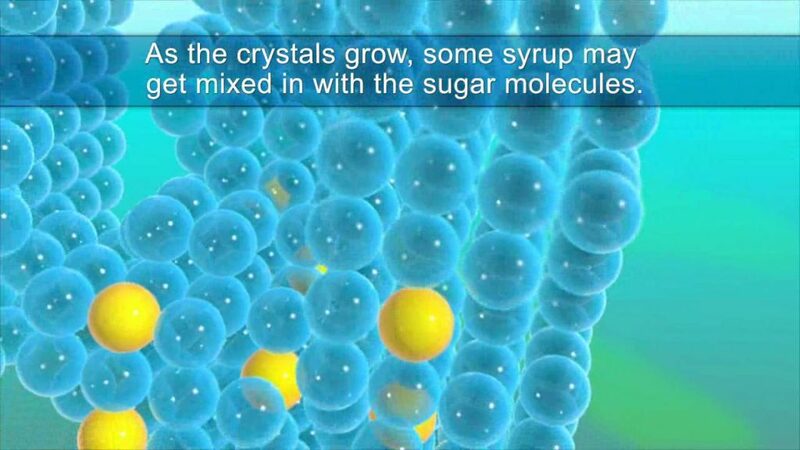 Crystallisation is a 2-step process: i) nucleation – the appearance of a crystalline phase from either a supercooled liquid or a supersaturated solvent ii) crystal growth – this is the increase in the size of particles and leads to a crystal state. During processing honey is heated to 70-75°C for 5-10 minutes to ensure melting of glucose crystals. Many chemicals require to be stored within certain temperature parameters, with a minimum temperature and a maximum temperature that they can be safely stored at. 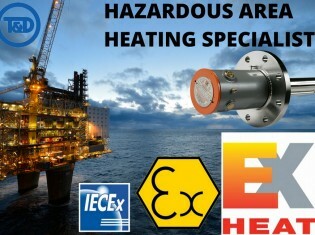 Our standard range of electric heaters are suitable for safe “non-hazardous” locations – contact us to discuss applications where the electrical heaters are to be deployed to provide process heating or frost protection in potentially explosive atmospheres such as Zone 1 or Zone 2 hazardous area locations according to the designation of the ATEX Directive. If the temperature goes outside the specified minimum or maximum parameters, the chemical can be adversely affected and may be no longer be usable or worse still, may become volatile and dangerous. 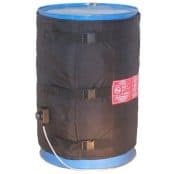 Temperature controlled chemical storage can be provided reliably by using process heating equipment such as heating jackets to warm the contents of drums and IBC’s to prevent freezing. ➡ Is your product too thick to pour or pump from Drums & IBC’s due to cold temperatures? 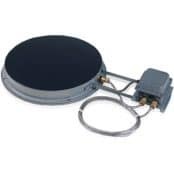 Thorne & Derrick can help by heating and thinning heavy viscous liquids prior to pouring and pumping using a comprehensive range of electrical surface heating products.